Hygienically packed and no artificial ingredients. Tulsi California Badam Giri Premium are excellent for health benefits like sharp memory & ayurvedic medicine. They are top on the list of the nuts for their huge benefits. Aside from being an abundant source of nutrients like magnesium, manganese, Vitamin E, protein, fiber etc, almonds are loaded with antioxidants. They are rich in nutrients like vitamin E, dietary fibers, omega 3 fatty acids and proteins. These almonds are relished by children and grownups alike. 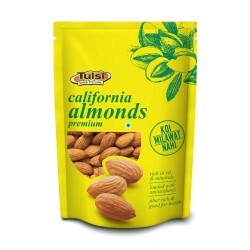 They are most healthy nuts for a lively lifestyle, they help weight loss as almonds are high in Protein and Fiber.